Hope has seen Haitians through hurricanes and revolutions, slavery and disease, economic distress. It was there as the world turned its back on slaves fighting to be free; and then, on dictatorships and violence. 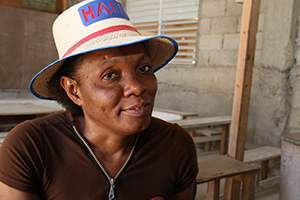 Now, hope is helping Haitians on the road to recovery from the earthquake that devastated their country 5 years ago, killing an estimated 230,000 people or more. Men and women meet regularly in neighborhood groups at various locations in this city of more than 4 million. Today the location is an outdoor classroom at a church. The groups are Catholic Relief Services Savings and Internal Lending Communities, or SILCs. They provide a way for members to save, borrow, and grow their savings to allow them to build a better future for themselves and their families. “There are many things that have changed since I joined,” says Marie Jeanine, a group member who wants to use the money to travel to Panama so she can bring back products to resell in Haiti. Marie, like many other members, sees this group as an opportunity to become a part of a supportive community. “The group allows us to have a platform to discuss different things in life,” she says proudly. The group calls itself “Etwal,” the Creole word for “star.” Most members know each other through work, or they live in the same area of Port-au-Prince. The heat of the day is rising as they come together, just as they have every week for the past 3 months. The group’s treasurer brings a tin box that has four different locks. For security, four different members each hold one of the keys. They must all work together to unlock the box, which holds their savings. The group is quiet and calm. Every member is valued and represented as they go through each step of the methodical weekly process. First, attendance. Then collecting funds from everyone for their group emergency fund. Then the collection of personal savings. In 3 months, the group has raised $1,000. You can feel the sense of hope—how each SILC member wants this program to lead to a better life. Loans from the savings may be used to start side businesses to supplement the income from their jobs, such as janitorial work, which may not pay enough for families to make ends meet. Side businesses are a way of life in Haiti. Whether it’s selling bags of water, charcoal for cooking, or baked goods, entrepreneurship represents hope for a better future for these husbands and wives, and their children. Before the earthquake, many group members had businesses, but they lost them as the devastation affected every part of their lives. “My dream is for my children to have a better life than what I’m giving them. I want to be able to provide for their education,” says Solurette Margaline Janty, who works as an archivist at a hospital. She is the mother of six children, two of whom were adopted after the earthquake. Her husband and youngest child are living with HIV. She hopes to start a side business that will allow her husband to earn a living without having to leave home. Listening to these proud Haitians, you understand why they call their group “Etwal.” The members of this SILC each have their “star”—their guiding light of hope visible out in the distance that allow them to face the many obstacles they encounter. They do this with open hearts and with the optimism and strength present in each group meeting, just as it is throughout Haiti. Find out more about programming in Haiti.